only 3km from Kingsway mall and lots of restaurants and pubs walking distance. Close to Kingsway mall, Royal Alexandra hospital, and a $10 cab ride to Rogers Place. Kingsway mall across the street is very convenient with a good choice of food at their food court. 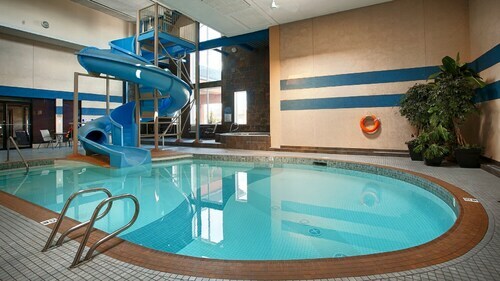 It's right across the street from Kingsway Mall and about 10 minutes from downtown Edmonton. Location is ok, with the Kingsway mall right across the street. The Kingsway Mall is across the street and the Yellowhead Hwy is nearby. Kingsway Mall is located in a vibrant area of Edmonton known for its beautiful river views and sporting events. Edmonton is home to 218 hotels and other accommodations, so you can find something that's perfect for your stay. Entire 2 Bedroom House in Quiet Area Downtown Edmonton. Near Ice District: Amenities in this vacation home include a kitchen and a patio. Our customers like its central location and comfortable beds. While you're in town visiting Kingsway Mall, you can discover everything there is to see and do within a couple miles of the area. Alberta Aviation Museum, Royal Alberta Museum, and Art Gallery of Alberta feature captivating exhibits. Sights like Sir Winston Churchill Square, High Level Bridge, and Rutherford House are must-sees while exploring the area. You can catch a show at Mayfield Dinner Theatre, Winspear Centre, and Francis Winspear Centre for Music. Rogers Place and University of Alberta are both worth a visit while you're checking out the area. You might also stop by West Edmonton Mall, located 5.6 mi (9 km) from Kingsway Mall, or South Edmonton Common which is 8.1 mi (13 km) away. Central Cozy and Comfortable! Separate Private Suite With Full Kitchen! Flights from Macdonald Cartier Intl. to San Diego Intl. Flights from Macdonald Cartier Intl. to Pudong Intl. Flights from Macdonald Cartier Intl. to Minneapolis St. Paul Intl.